If the signature American private eye series of the 70s was The Rockford Files then the 80s equivalent was Magnum, P.I. and that immediately lets us know just how different these decades were. Jim Rockford lives in a trailer. Magnum lives in a mansion in Hawaii (even if he doesn’t own it). 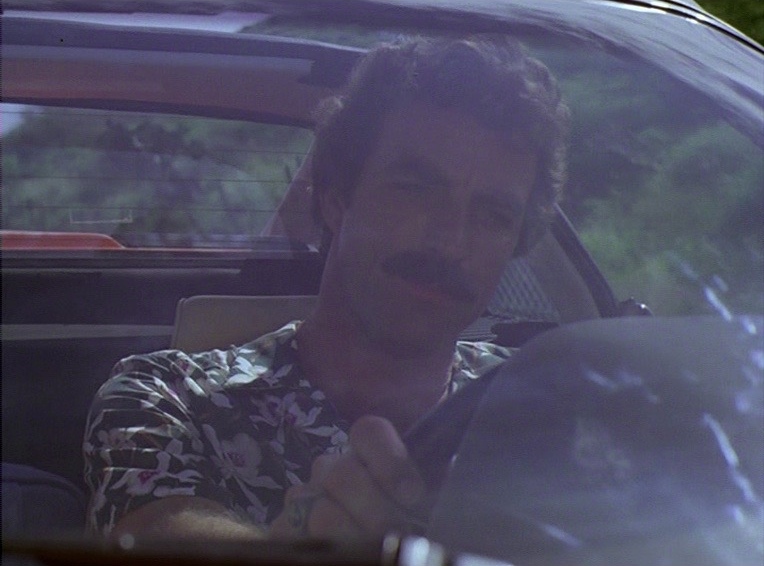 Rockford drives a bottom-of-the-range Pontiac Firebird, Magnum drives a Ferrari (even if he doesn’t own it). Rockford has been in prison. Magnum was obviously born into wealth and comfort. The 70s was the decade of cynicism. There was glamour but it was a decidedly sleazy glamour. The 80s would be the Decade of Greed. There would be glamour and it would be flashy and trashy. That's not to say the 80s weren’t cynical. Maybe they were more cynical than the 70s, but it was the decade in which we came to accept cynicism. Cynicism was the New Normal. Even the fact that Magnum’s wealth isn’t real is significant. The 80s was when we discovered we could live on credit forever. Magnum, P.I. was created by Donald P. Belisario and Glen A. Larson, two figures who would play major rôles in 80s action/adventure television. Larson created the archetypal 80s action/adventure series, Knight Rider. You don’t expect originality from Larson but you expect high-octane action and a certain amount of style. Belisario would go on to create Airwolf, the best of all the 80s action/adventure series. From Belisario you also expect high-octane action but with a definite dash of intelligence. Magnum, P.I. premiered in the same year that Hawaii Five-O ended its incredibly twelve-year run. It would have been a crying shame to see the production facilities that had been established for Hawaii Five-O not being used so Magnum, P.I. which had originally been intended to be about a private eye living in a Hollywood mansion became a show about a private eye living in a Honolulu mansion. 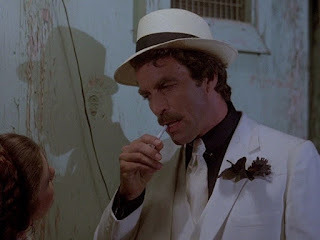 One of the fun things about Magnum is that while Hawaii Five-O was a fictional state police agency it is often referred to in Magnum as a real agency. 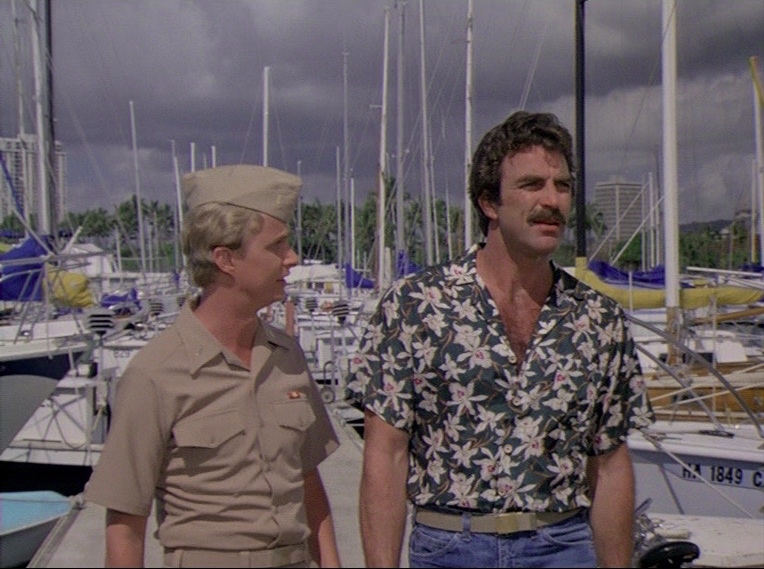 In fact you could argue that Hawaii Five-O and Magnum both take place in the same fictional universe. Both shows use the Hawaiian settings to maximum advantage. Production values are high. Tom Selleck has the right mix of relaxed charisma and mischievous charm. He does the action hero stuff well, he handles the light comedy with ease and when he’s called upon to do slightly more serious acting he’s quite adequate. John Hillerman is fun as Magnum’s nemesis Higgins, who is determined to clip Magnum’s wings. Roger E. Mosley and Larry Manetti as Magnum’s old army buddies T.C. and Rick make fine sidekick material. Magnum, P.I. kicks off with the two-parter Don't Eat the Snow in Hawaii. It establishes Thomas Magnum’s character. He had been a Navy officer and he’d left the service under a cloud and with a reputation for indiscipline and insubordination. We know he’s a Loner and a Maverick. We know he doesn’t play well with the other children. He’s a Trouble Maker, but he’s also Brave and Resourceful and he’s also a bit of a Don Quixote. And he has a certain appreciation for the female of the species. In other words he’s a walking cliché. Whether that will work or not depends very much on Tom Selleck and on whether he has the charm to make Magnum likeable and whether he has the charisma to make him interesting. It becomes obvious very early on that the answer to both questions is likely to be in the affirmative. This episode also introduces the other main characters. Higgins (John Hillerman) is an ex-British Army sergeant-major who runs the Hawaii estate belonging to bestselling thriller writer Robin Masters (we never actually see Robin Masters and he doesn’t seem to spend any time in Hawaii). Higgins of course disapproves of Magnum. Their antagonism follows predictable lines - there’s both conflict and grudging respect - but both actors are good enough to make it amusing. Despite the grudging respect both Higgins and Magnum are too stubborn and too childish to work out their differences. Magnum lives on this estate, he’s supposed to be in charge of security (his duties don’t seem to be particularly onerous), we don’t really know how he got such a comfortable berth but presumably the owner of the estate finds him amusing. Higgins considers Magnum to be basically a freeloader and to an extent he’s right. Magnum is a private investigator who gives the impression of being very up-market but like so many things in the 80s this may be largely an illusion. We also meet his buddies from Vietnam. He’d been in some kind of covert operations outfit. Vietnam would cast a huge shadow over quite a few 80s action-adventure TV series, notably The A-Team and Airwolf, as well as Magnum, P.I. In all these series there is a common assumption that neither the government nor the military can be trusted. Episode two is China Doll. Magnum is rather sweet on a cute Chinese antiques dealer named Mai Ling. She hires him to protect her and a fabulously valuable Chinese vase for two days. It sounds like an easy job but it nearly gets Magnum and his buddies Rick and TC killed. The guy trying to steal the vase is a Chinese martial arts master and he’s a psychopathic Tong assassin as well. Thank Heaven for Little Girls and Big Ones Too seems like a missing persons case, nothing unusual in that except that his clients are five schoolgirls. Just looking at their innocent childish faces Magnum knows that these are obviously clients who can be trusted implicitly. That’s his first mistake. Then there’s the girls’ pretty blonde teacher. He trusts her too. That’s his second mistake. Of course she doesn’t really thinking that stealing a Gauguin worth several million dollars is a crime. She has a really good explanation as to why it would be silly to get the police involved. This episode has a kind of interesting double plot which works rather well. This is a fun little story, very light-hearted but it has style and it has charm. In No Need to Know there’s another house guest and he makes things a bit tense, given that he’s a British Army brigadier and the IRA is actively making plans to assassinate him. The American intelligence people are not officially involved but unofficially they’re keeping a close on things (they’re not happy about the idea of foreigners getting assassinated on American soil), and they’re worried enough to call in some unofficial help. 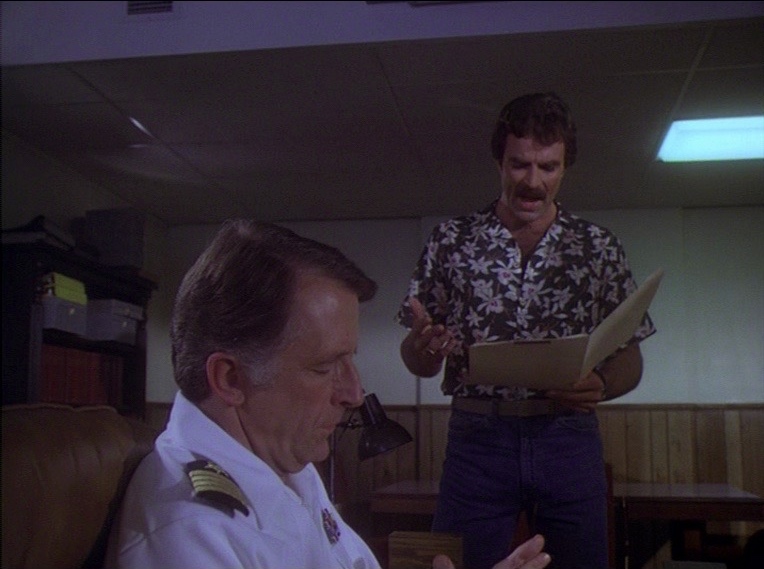 In fact they hire Magnum to keep a watch on the brigadier. Being intelligence agency people they naturally don’t bother to tell Magnum what’s really going on. This is a darker episode and it’s pretty good. Skin Deep is a murder mystery in which Magnum has to do some serious detecting. A famous actress has committed suicide by blowing her head off with a shotgun. Her estranged husband hires Magnum to prove that it was really murder. And given that a beautiful woman who decides to commit suicide does not do so by blowing her head off with a shotgun Magnum thinks it’s murder as well. Magnum has to deal with lots of Vietnam flashbacks in this episode, and has to solve the case without getting killed himself. Quite a good episode. In Never Again... Never Again Magnum is up against Nazis! The obsession with Nazis that is such a remarkable feature of 60s and 70s TV was obviously still going strong even in 1980. This story does at least manage one original twist on the theme. The Ugliest Dog in Hawaii belongs to a wealthy socialite. Sir Algernon Farnsworth really is a dog that only an owner could love. Curiously enough an ageing gangster is determined to get his hands on Sir Algernon. This episode is a total romp and it works splendidly. A government quarantine officer who is terrified of dogs, an elderly mobster who thinks it’s still the glory days of Prohibition, his incompetent henchmen who represent the new generation of gangsters except that they are entirely clueless, plus Higgins doing his social climbing thing and Magnum has his hands full. Enormous fun. Missing in Action is another Vietnam story. A singer has arrived in Honolulu looking for her boyfriend Eric Tobin. He was a Marine and was posted as missing in action in 1972 but she is convinced that he is alive and in Honolulu. Magnum starts digging around. And he finds that a rather sinister character from Delta Section is also taking an interest in Eric Tobin. Delta Section is one of the more shady U.S. intelligence agencies specialising in black ops. If they’re interested in Eric then it’s a fair bet that either he’s alive or they’re trying to cover up the circumstances of his death. A very dark but very good episode. Lest We Forget presents Magnum with a considerable challenge. A nominee to the Supreme Court hires him to find a woman he once knew in Honolulu. What makes it a challenge is that he hasn’t seen her since December 7, 1941. Magnum is pretty sure the judge is not being entirely truthful with him. In fact nobody is being truthful with him in this story. A number of Magnum episodes deal with the wounds left by the Vietnam War, so it’s interesting that this episode deals wounds left by an earlier war. This is quite a neat little tale. The King Kamehameha Club, run by Magnum’s old navy buddy Rick, is cursed by a kahuna (a kind of priest/sorcerer) and the curse soon has fatal results for a competitor in a surf ski race. But why would anyone want to curse the club? Magnum thinks he may know but then his neat theory seems to come crashing down. Overall The Curse of the King Kamehameha Club is a good episode. In Thicker Than Blood T.C. makes the mistake of trying to repay a guy who saved his life in Vietnam. Unfortunately Joey is a junkie and a loser and trying to help a guy like that is just asking for trouble. And T.C. gets lots of trouble. Like the possibility of five years in prison. He doesn’t want Magnum and Rick to help him but they’re going to do so anyway. Helping T.C is going to require Magnum to get some coöperation from some very unwilling allies. A pretty good little story. All Roads Lead to Floyd seems to be a routine missing persons case. A young woman is looking for her father, the only clue to his whereabouts being a postcard from Oahu. His daughter is not the only one looking for Floyd Lewellyn (Noah Beery Jr). Floyd is a small-time crook and con-man and he owes money all over the place. And some of the people looking for him definitely do not wish him well. Noah Beery Jr is delightful as the loveable old rogue. This is a fairly light-hearted episode and it’s thoroughly enjoyable. The Adelaide in the episode Adelaide is a 32-year-old woman from Iowa who wears sensible shoes and wants to hire Magnum as a bodyguard for Norman. What he doesn’t realise is that Norman is a horse. On the other hand he is a very very valuable horse. Quite an amusing episode. In Don't Say Goodbye Magnum is called in by an old friend, an elderly blind lady. She’s being blackmailed, or rather she’s being blackmailed on behalf of her grand-daughter. The grand-daughter is an old flame of Magnum’s but there’s something not quite right about her. Magnum’s sensitive side is very much in evidence in this story. It’s an OK episode. The Black Orchid is the kind of Magnum episode that I enjoy. It’s a bit tongue-in-cheek, it’s stylish, it has glamour and humour and it’s lightly offbeat. Louise DeBolt is a very rich young woman and she’s bored and she deals with her boredom by living out her fantasies. No, not sexual fantasies. These are more in the nature of romantic adventure fantasies. A bit like acting out scenes from old movies (it’s no coincidence that she had originally wanted to be an actress). She hires people to play various rôles in her fantasies and when her fantasies call for a hardboiled private eye type she naturally hires Magnum. Magnum doesn’t mind. It’s more fun that most of the case that a PI works on and Louise’s games all seem very harmless. Of course they’re harmless as long as everyone understands they‘re games and as long as reality and fantasy don’t start to collide. But that’s exactly what happens and Magnum starts to suspect that thee’s something sinister going on, but of course the problem is that Louise is so addicted to her games that it’s impossible to be sure if she’s really in danger or if it’s just another level of game-playing. It’s a very well executed and very enjoyable episode. J. "Digger" Doyle is a female security operative called in when Robin Masters life is threatened. Her presence irritates both Magnum and Higgins. It’s kind of fun to see Magnum and Higgins working as genuine allies. One of the trademarks of the series is that we never see Robin Masters. We almost see him in this episode. We do hear him. And it’s the voice of Orson Welles! A well constructed episode. In Beauty Knows No Pain a crazy lady hires Magnum to find her boyfriend Roger. Everybody wants to find Roger. And some of them do not wish him well. Magnum also gets conned by T.C. into entering the Ironman triathlon competition which oddly enough provides the key to the case of the missing Roger. A very amusing very witty episode. 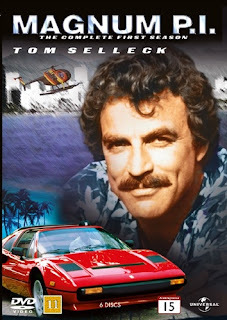 The first season of Magnum, P.I. is very stylish sometimes slightly outrageous fun. Highly recommended.